One of the highlights of the year is attending the 2015 BYU Conference on Family History and Genealogy. We enjoyed seeing so many friends at this conference. It's always a great time to visit and catch up with fellow genealogists. It was a privilege to meet Jana Last, a good friend who I've known for a long time online but had never met. We love this conference every year and the chance to hang out with the genealogy community. We were thrilled to take our newest employee, Wendy Johnson, to her first conference. She was a rock star in greeting new customers and we loved having her there as an addition to our team. We love genealogists and we couldn't wait to introduce Wendy to the wonderful people we get to work with. I'm sure you'll enjoy getting to know her as well and she is already becoming an expert in creating the perfect chart for your family. 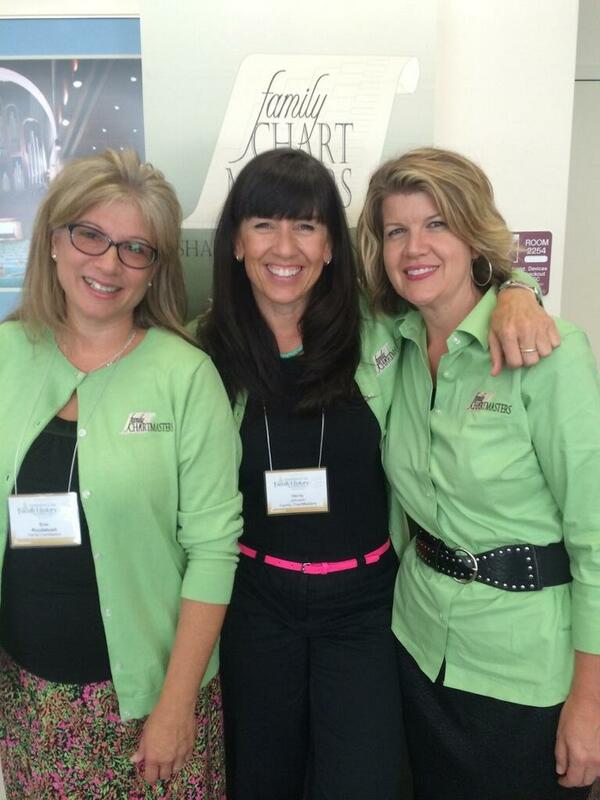 Our new matching cardigans and shirts embroidered with the Family ChartMasters logo were also a big hit. We garnered lots of fun comments and potentially inspired a few others vendors to take a look at matching shirts as well. We are excited to have our matching green tops for RootsTech 2016. It will be easy for you to see who the chart experts are! Check our calendar for the upcoming family history conferences in Ogden and Riverton---we hope to see you there! It was an absolute pleasure to meet you in person at the BYU Conference Janet!